Rubberway Multi-Purpose was installed at this new community and recreational facility built by Brookfield homes as part of the Google and You Tube campus living environment. 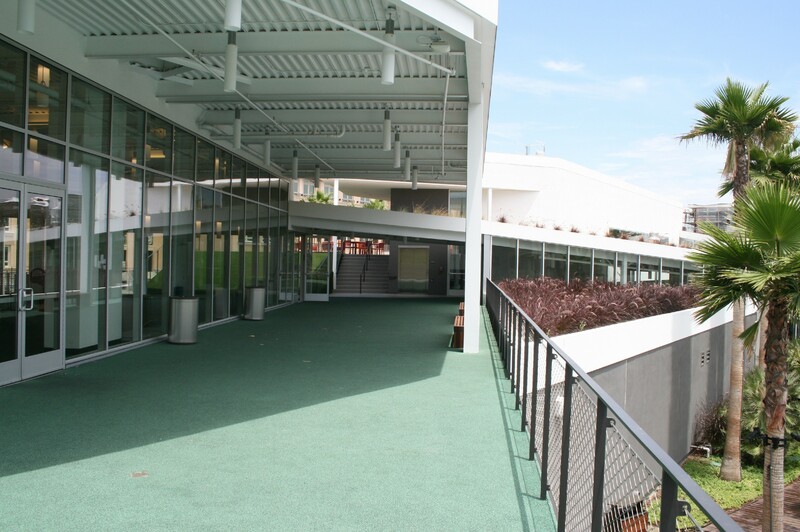 This custom, non-porous Rubberway Multi-Purpose system is installed on the second level of the facility and is considered a rooftop application. This system was chosen due to the ability to customize the thickness which allows it to taper off from a 1-inch thickness to 3/8 inch thickness to meet the balcony edge in order to encourage water to flow away from the building. Additional benefits include sound dampening and a high coefficient of friction making this a safe, non-slip surface. Rubberway Multi-Purpose can be customized to varying thicknesses and porosity rates and can also be made nonporous as in this project. It can also be installed on slopes such as alongside stairs and on handicap ramps.